Does Rahm Emanuel still get it after suppressing the tape? These are the two lines from High School Junior Onam Lansana’s “When Spike Lee Didn’t Do the Right Thing” that he says make the poem. This poem, like most of his poems, reflects upon the current issues polarizing Chicago from gentrification to police brutality. And, despite his youth, his pieces resonate. Lansana performed his slam poetry piece about Islamophobia at the semifinals of the citywide high school slam-poetry competition Louder than a Bomb (LTAB) run by Young Chicago Authors. Slam poetry is a competition that involves performing and reciting poetry. Lansana’s passion poured into the microphone, his t-shirt proudly emblazoned with his team’s name. Lansana accompanied his recitation with choreography that included movements like running in place. The audience erupted into applause. Lansana just scored a perfect 10 for his team, Rebirth Poetry Ensemble. LTAB, founded in 2001 by Kevin Coval and Anna West, was intended to be a safe space for teenagers and young adults to voice their opinion and experiences. Over the past 15 years, the organization expanded into a month-long poetry festival featuring 120 Chicagoland high schools, according to the Young Chicago Authors website. Just as he was about to announce the winner of the semifinal, the emcee paused. All the contestants stood on stage at the Metro Chicago, hugging with hearts pounding. The winner from this bout, where four teams competed, would get to go on to the finals on March 19. And then, the emcee announced the news the team had been waiting for. After performing several individual poems and one group poem Sunday afternoon, March 13, Rebirth Poetry Ensemble came in first place. By the evening of March 19, they were declared the winners of the entire LTAB competition. But, perhaps the win had come before this. It came before the celebratory ice cream at Wrigleyville Dogs across the street from the Metro, before the group poem performance about police brutality, and it came before teammate Lansana’s perfect 10. Their victory came before all the other poets on the team performed their individual works followed by their teammates cheering them on with their slogan “Honey, where is my super suit?” A slogan that started from an inside joke about “The Incredibles.” One of the teammates stormed into their practice room and just arbitrarily shouted it. And for whatever reason, they kept saying it to each other, eventually letting it become the team’s tagline. No, perhaps the win came weeks or even months before in their rehearsals leading up to the much anticipated March 13 performance. The team typically rehearses a couple of times a week, but right before the semifinals, they were rehearsing four or five times a week for two hours a night. They put all of their energy into making their poetry performances the best that they could be. Rebirth is run through the community arts program at the Reva and the David Logan Center for the Arts at University of Chicago. Rebirth also features Onam’s brother Nile Lansana, Sydni Goodrum-Davis, Nate Russell, Maya Dru, Banu Newell, Stella Binion, Simone Reynolds, Myles Gibbs, Jupiter Dandridge and Adam Ross. Quraysh Ali Lansana and Emily Hooper Lansana, Nile and Onam’s parents, and Avery R. Young coach the team, along with assistant coaches Bryant Cross, Toni Asante Lightfoot and Jonathon St. Clair. Goodrum-Davis has proven she is not afraid of a challenge. Just a few days before the competition on Sunday, she came down with strep throat. And being ill, she was more terrified she would not be able to perform. But, with a few doses of antibiotics, she mustered the energy for the semifinals. She discovered her love for poetry when she competed in eighth grade with her middle school team. 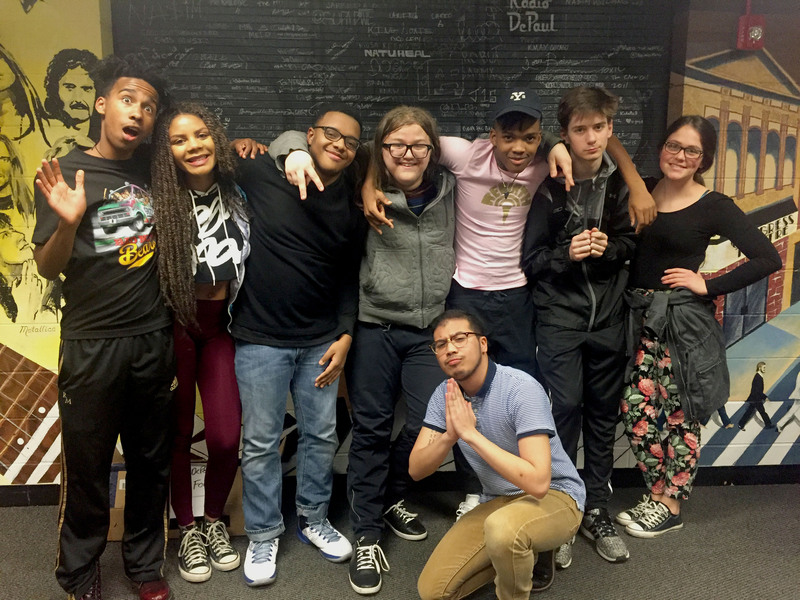 LTAB allows some middle school teams to compete alongside the high school teams. By the time she reached high school, she continued her involvement within the poetry community by joining Rebirth. Teammate Nate Russell had never written poetry before this year. Onam Lansana, his best friend since Russell’s freshman year, introduced him to it. He had watched Rebirth perform in poetry slams for a while and by junior year he was ready to try it out. Russell had always liked doing artistic and creative hobbies, like writing or making music, so he was excited to explore this new outlet. For poets like Goodrum-Davis and Russell, the main motivation for doing this comes from their desire to have a creative outlet in a safe space. But that does not mean that the competitions and the chance to win are not fun and exciting too. Dru got involved with Rebirth when the star of the movie “Louder than a Bomb” came to speak at her high school. The film is a 2010 documentary about the poetry competition. The event turned into a workshop where the students got to work on their poems. And Dru just so happened to sit next to Lansana. Lansana read over Dru’s shoulder, instantly impressed by her poetry. Dru, while flattered, did not believe him right away. But, Lansana got her to send him her poems and a couple weeks later the coaches of Rebirth invited Dru to one of their workshops. And, like everyone else on the Rebirth team, Dru had found a new family. But Rebirth is not the only group of teens who are inspired by LTAB. “I started writing poetry last year while recovering from my concussion, sitting in my dark bedroom. I had nothing else to do but think. So I decided to write [the thoughts] down,” said high school senior Claire Derosa. After this, Derosa and her friend Sarah McKee started their own slam poetry club at their high school, Maine South in Park Ridge, Illinois, and decided to compete in Louder than a Bomb. During the same time, both had become interns at Young Chicago Authors and became more familiar with the competition, deciding to pitch competing to their club. The poetry competition concluded at the March 19 finals, but this is not the end for McKee, DeRosa or the Rebirth team. Even at the mundane Wrigleyville Dogs, celebrating their semifinal victory, the team was bursting with creativity. Photo by Bea Aldrich of Rebirth teammates (l-r) Banu Newell, Sydni Goodrum-Davis, Nile Lansana, Adam Ross, Onam Lansana and Nate Russell. At center: Young Chicago Authors intern and Radio DePaul host Michael Cuaresma. At right: Radio DePaul host Lindsie Bliss.